» A conversation with Vince Keenan about MICHAEL SHAYNE. A conversation with Vince Keenan about MICHAEL SHAYNE. Just wanted to thank you for your recent M*F post about the Michael Shayne movies coming to DVD this week. The photos of all the actors who played the part are much appreciated, as is your support for my Kenneth Tobey idea. If only … As for the Sleepers West/Sleepers East business, your guess is as good as mine. I look forward to your reviews of the films. Pop culture, high and low, past and present. I don’t know if you’d agree that the portrait of Shayne on the paperback covers is definitive, but since those are the Shayne’s that I read back when I was reading them, that’s the image that comes to mind when I think of Mike Shayne. 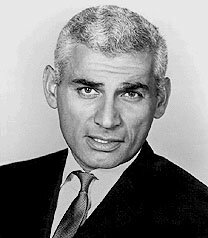 But, and it’s a big “but,” Jeff Chandler played Michael Shayne for a couple of years on the radio. Maybe I should do a follow-up and include his picture? Or not, since nobody ever saw this face in the role … ??? I suppose I do think of that portrait of Shayne as definitive. It’s on the cover of every one of the novels I’ve ever read, and it’s featured prominently on all of the websites devoted to the character. Not that that necessarily means anything. A big reason why Kenneth Tobey struck me as perfect for the role is that he has red hair — which, of course, you couldn’t see in black-and-white. I picked up the Shayne discs yesterday. Fox has put a dandy package together. Nice extras throughout. Last night I watched the first film in the series as well as a 17-minute feature on the history of the character. I feel bad that I ever implied anything negative about Lloyd Nolan, because he’s dynamite in the part. It’s not the Mike Shayne from the books — he’s more of a generic big-city P.I. — but Nolan fills out the role beautifully. I think this series will be rightly reevaluated in the wake of this release. You asked and so here it is — a link to a Michael Shayne radio show with Jeff Chandler. This one’s from July 22, 1948, if the source I got it from is correct. The series is called The New Adventures of Michael Shayne, and was on the Mutual network from 1948 to 1950. An earlier series with Wally Maher as the star was on ABC between 1944 and 1947, and there was a later one on ABC again for the 1952-53 season. The star was Donald Curtis, or so I’m told, replaced by Robert Sterling. The episode that the link leads to is #5 in the Jeff Chandler series, titled “The Case of the Hunted Bride.” In my opinion this was one of the better PI shows on the radio, and I think Chandler was very effective in the part. Whether he’s “Mike Shayne” or not is a whole other kettle of fish. As for Lloyd Nolan, after your comments, I’m all the more anxious to get my set in the mail. If I’ve seen any of these Shayne films, it hasn’t been for 50 years, so who remembers? …As you might have guessed, I’ll be writing up a more in-depth look at the DVD set once I’ve watched all four films. At this rate, it will probably be sometime this weekend. If no living (or dead, for that matter) actor is quite right, there should be an animated Mike Shayne cartoon show! In the style of original paperback covers, of course. >> Just looking again at this comment now, a couple of weeks later, it has belatedly occurred to me that there was a Dell comic book featuring Mike Shayne. This would have been around the time of the TV shows. I wonder who Mike Shayne looked like in those … ? Thanks for the link. It’s nice to see those covers again. It’s the interior art that I was thinking of, though, and how Shayne was pictured in the stories themselves. All we get is the back of his head on one of the three covers … nor does the cover art on comics always match what’s inside. I’ll see if I can locate of those three issues. I’m interested now!